SKA St. Petersburg It’s a record! October 7, 2017 / NationalTeamsOfIceHockey / Comments Off on SKA St. Petersburg It’s a record! SKA set a new KHL record for consecutive victories, picking up its 19th win in a row since the start of the season to move past Avangard’s mark. But Sibir made it tough for the Army Men, threatening to crash the party with a resilient display and a third-period fightback. SKA’s success this season has been built on rollicking offense; this week alone the team blasted 12 goals in road games at Lokomotiv and Salavat Yulaev. Nikita Gusev and Ilya Kovalchuk were in red hot form, and the crowd settled down to await the latest firework display. And waited. And waited. The first intermission arrived, and the game was goalless. And, by recent standards, bereft of goal action. SKA was limited to nine shots at Alexei Krasikov and when the goalie was beaten, a video review reprieved him. After the break, finally, SKA found its scoring form. The third power play of the night ended with Gusev setting up Sergei Plotnikov to break the deadlock. Two minutes later, Dinar Khafizullin made it 2-0. This was more like it, but the home team’s progress was disrupted by penalty trouble and Sibir was still in the game – just – after 40 minutes. Jonas Enlund pulled a goal back in the 49th minute, and suddenly a routine engagement was starting to look problematic. 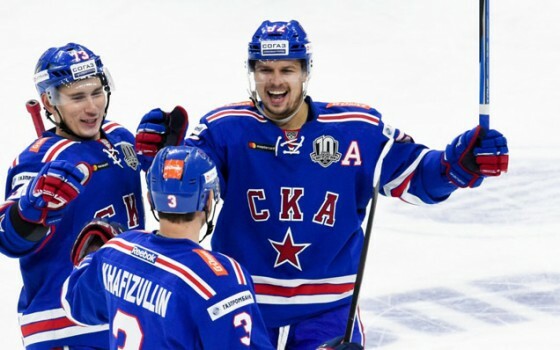 The winner came from an unlikely source: Evgeny Ketov is a player often overlooked on SKA’s stella offense, but he came up with the all-important goal when he surprised Krasikov with an early shot from the top of the circle. Sibir tried to battle back, and Simon Onerud got his first goal for the club after moving from Sochi, but SKA closed out the game and established that record.